At Clarabut & Plume Funeral Directors we have served the local community of Bedford since 1895. Our funeral home, built in the early 1960s, is located near the town centre, making it easily accessible to local families in Goldington, Sharnbrook, Biddenham, Bromham, Wilstead, Fenlake and beyond. We understand how difficult it can be to lose a loved one, which is why we will do everything we can to make things easier on you. Your wishes will be carefully listened to and the funeral service organised exactly the way you want. Our funeral directors specialise in Italian funerals and repatriation and our funeral home has wash and dress facilities suitable for our Sikh and Hindu families. We strive to provide the utmost care and high quality service, whilst honouring your cultural or religious requirement. Arranging a funeral can be hard and emotional, so please know that you are not alone. Call us any time you need, we are here to help you through every step. Call us today on 01234 354547 to talk through your personal requirements. We are just off St. John's Roundabout, opposite the Magnet Kitchen Showroom. Our staff are available 24 hours a day on 01234 354547 if you require our services outside of these hours. Dealing with the death of my Sister Vanessa Grant was hard enough but having to organise the funeral too was a very difficult task for myself and my family but we managed to give her the send off she deserved with the caring and respectful support we recieved from Clarabut and Plumbe especially from Olivia Goodwin who dealt with our family personally. I will be forever greatful for all the effort that went into making it as smooth running as it was. I just want to take this opportunity to thank you from the bottom of my heart. And will visit soon to show my appreciation with a box of chocolates. Thank you for taking the time to share your thoughts with us. I am pleased that the arrangements for your Sister were carried out to your satisfaction. I am glad that we were able to provide you with the care and support needed at this time and that you were so well looked after by our team. Faultless service throughout. It was wonderful to have such professional support and guidance. Thank you for taking the time to send your online review to us. I am pleased that we provided the highest level of care and guidance to you and your family at such a difficult time. Fantastic service from the Bedford team. The family were very happy with the service we received. Everybody was very professional, yet friendly and kind. Pat at the office was efficient and helpful, keeping us informed at every step. On the day of the funeral, the staff were kind and supportive. We are very grateful. They made a difficult time much easier. 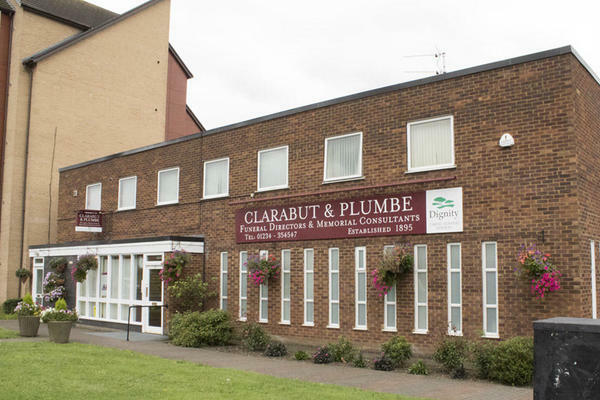 Both Amanda and Simon at Clarabut & Plumbe were excellent in the friendly and professional service they provided. Amanda fully explained the funeral plan beforehand and then planned all the arrangements to ensure that everything was in place and ran smoothly on the day, despite the short timescales. Simon was with us on the day of the funeral and put us all at ease and looked after us, explaining all the time, what would be happening and what we needed to do. He was also really kind to myself and my daughter when we came into the branch to spend some time in the chapel of rest with my deceased husband/her dad and nothing was too much trouble. Both myself and my two daughters felt that the whole family were treated with lots of kindness, dignity and respect and Simon and Amanda made such a hard couple of weeks seem so much easier to endure. Thank you both - we can't praise you enough. Thank you for the kind comments posted on your online review. I am pleased that we provided the highest level of care and guidance to you and your family and that we were able to help make things easier for you at such a difficult time. The staff i dealt with were very helpful and dealt with all my requirements professionally and also showed a caring nature i was very satisfied with the way everything was handled.